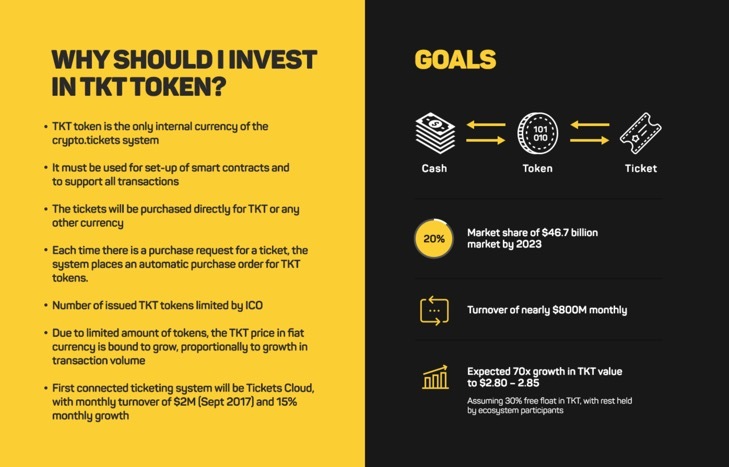 Why should I invest in TKT token? Why should I invest in TKT? Why is TKT the token going to grow in value? We estimate the early buyers of TKT could realize 70x return on their investment over a 5-year holding period. TKT token is the only internal currency of the Crypto.Tickets non-centralized system and is used to set-up smart contracts and to support all transactions. The tickets will be purchased directly for TKT or any other supported fiat or crypto currency. Each time there is a purchase request for a ticket in another currency, the system places in automatic purchase order for TKT token(s) via an automated and transparent algorithm. As the number of users and the volume of transactions grow, the demand for TKT will also grow. At the same time, the number of available tokens will be limited by the ICO, causing the value of TKT to increase relative to other currencies. Our goal is to reach 20% global market share in electronic ticket sales by 2023, with the market size estimate of 46.7 billion USD. This will enable turnover of nearly 800 million USD monthly and the expected 70x growth in USD value of TKT from XYZ to $2.80 – 2.85, assuming 30% free float in TKT, with the rest held by various participants of the ecosystem. 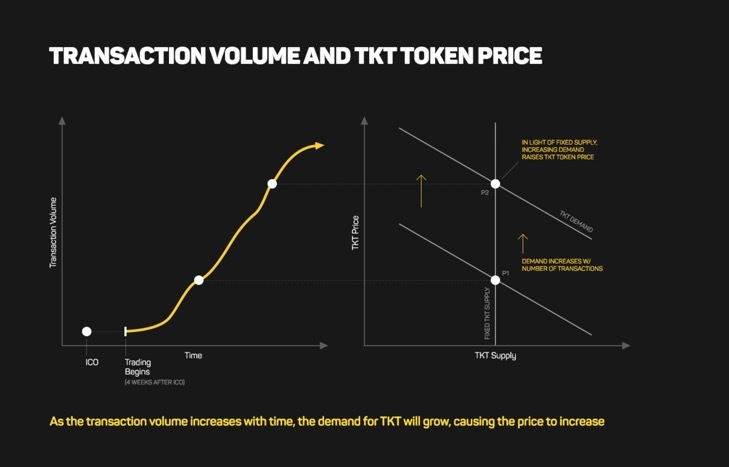 At some future time, as we reach an equilibrium share of the global market, the gain in transactions will plateau and hence the growth in the TKT value will slow as well. By that time, all early-stage investors, who contributed risk-capital during this early phase, will have had a chance to exit their investment at a high multiple. Majority of the TKT tokens will be distributed amongst various system participants, mostly events industry players, who will use them for active operations. A part will remain with key players to extend voting influence over the future of Crypto.Tickets via voting, and some will form an automated buffer fund that will provide liquidity and smooth-out any sharp spikes due to significant increases in transactions caused by popular event sales. TKT token will start trading on the exchanges four weeks after the end of the ICO. The launch of the Crypto.Tickets platform is scheduled for June 2018. The first ticketing system connected to the platform will be Tickets Cloud, with the current monthly turnover of 2 million USD (as of September 2017) and a monthly growth rate of 15%, guaranteeing an immediate transaction volume for the TKT token.